3-D Monster: Back From Virginia! 1.) Picking our route using "Yahoo Maps". 2.) Not paying enough attention to the crappy route we were taking. 3.) I forgot my damn camera!!!! I've made this trip before, and I guess I used "Mapquest" in the past, and save for the unavoidable trip through the traffic nightmare that is Hartford, Connecticut, we usually had no trouble reaching our destination. However, the route Yahoo maps had chosen for us took us straight through friggin' MANHATTAN!! I could not believe it; I'm looking around, and I start seeing these "all american city signs" with "The Bronx" written on them, so I say to my wife; "I think we're going into the city". To which she replies; "that's crazy; we're nowhere near Manhattan". Anyway, the further we go, the dirtier & more covered with graffitti everything becomes! It's about this time my youngest screams; "I hafta go to the bathroom! ", and my anxiety level goes up to 10! That's when I see the sign; "George Washington Bridge - 1 mile". DAMNITT! I knew we were in Manhattan! I tell my youngest that there is no way that I am getting off the interstate while I'm in the Bronx, and he will just have to hold it until we reach New Jersey or pee in a water bottle. But just before we reach the GW bridge, we look to our left, and we can plainly see the city; the Empire State Building and the Chrysler building are in plain view. While my wife and I think this is very cool, the kids were none too terribly impressed. Going into the GW bridge was nothing short of imposing and awe-inspiring. 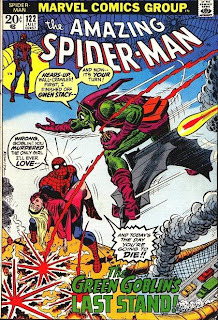 It's around this time that I remember; "hey kids - this is where the Green Goblin killed Gwen Stacy" "COOL!! "they both shout in unison. The rest of the trip was rather dull - our detour through New York's bottleneck traffic jam caused us to get to the hotel after 11, so I just gobbled down three of the 2 dozen Krispy Kreme donuts that my parents had generously picked up for us on their way up, and promptly went to bed. The next day my mom gave us their route map from AAA from when they drove up to Maine last February, and our return trip was much faster and more enjoyable. I wanted to stop at various shops and attractions on the way back, but we both got a crappy night's sleep as neither of us can ever sleep worth a damn in a hotel, so we decided to go straight home. The only extended stop we made was in a tiny mall somewhere in New York to eat lunch, and I picked up a new "Wizard Magazine" and "Invaders/Avengers" #11. However, while the kids are at my folks, we will be going somewhere for the weekend with my wife's cousin and her husband. Not sure where, but Boston via train and Burlington, Vermont are both on the table as possibilities. Oh, and this time I'll remember my camera for you guys! If anyone has any suggestions for things to do in these places, I'd love to hear them!